Best known for I.F. Stone’s Weekly, his self-published newsletter, I.F. “Izzy” Stone covered administrations from Wilson to Nixon in reports and editorials. Among the major events he wrote about were the Depression, World War II, the Korean War, McCarthyism, the Vietnam War and the Civil Rights movement. He was the first reporter to question President Lyndon Johnson’s misleading statements about the Gulf of Tonkin incident, which led to the escalation of the Vietnam War. He wrote more than a dozen books and was the target of FBI surveillance for openly criticizing its practices. He died of a heart attack on June 18, 1989. At the young age of 14, I.F. Stone starts his first newspaper, The Progress, writing about topics such as a free India and support for Woodrow Wilson’s peace plan. 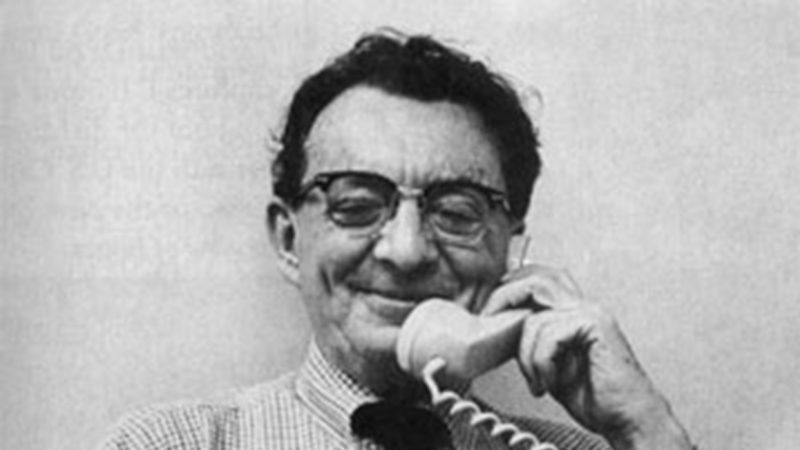 J. David Stern, publisher of the Camden (N.J.) Courier-Post, asks Stone to be a correspondent in Haddonfield, where his family lived. Graduating from high school at age 16, Stone becomes active in the campaign of third-party candidate Robert La Follette while continuing to work as a reporter. He enters the University of Pennsylvania, studying philosophy. Stone drops out after his junior year. Looking for work, Stone lands a job editing articles at The Philadelphia Inquirer. In his last direct involvement in a political campaign, Stone volunteers to be a publicist for the presidential campaign of socialist Norman Thomas. Later that year he returns to work for Stern at the Courier-Post. When Stern acquires the Philadelphia Record, he transfers Stone to the Record’s staff. With most newspapers in financial trouble, Stern fires many of the Record’s upper ranks and Stone becomes the youngest lead editorial writer on a major daily newspaper. Stone moves his family to New York to write editorials for the New York Post, which Stern buys. Stone also contributes articles to The Nation and Modern Monthly. Isador Feinstein legally changes his name to I.F. Stone. In a dispute with Stern and the managing editor of the Post, Stone is demoted from the editorial staff to the news department as a special writer. He files suit through the Newspaper Guild alleging unfair practices, and in arbitration, U.S. Court of Appeals Judge Francis Biddle rules against Stone. He resigns from the newspaper. Stone accepts an offer to work full time at The Nation as an associate editor. Later that year, he moves to Washington with his family and becomes the Washington correspondent. In a series for The Nation titled “Washington Gestapo,” Stone uses an anonymous source to reveal that J. Edgar Hoover is spying on government workers. The FBI had been keeping a file on Stone since 1936 because of Stone’s editorial comments on the bureau. When PM folds, Stone writes briefly for the New York Star and then for the Daily Compass. Writing “The Hidden History of the Korean War: 1950-1951” in the midst of the war, Stone investigates its origins and questions the official explanations for why America went to war. After the Daily Compass collapses, Stone starts his own paper, I.F. Stone’s Weekly. He conducts all of the investigating, writing, printing and distribution with the assistance of his wife, Esther. Contradicting the official line, Stone reports that the Atomic Energy Commission’s first underground atomic test was detected up to 2,600 miles away instead of the mere 200 miles away as the United States government had claimed. His reporting dispels the government argument that the test ban allows the Soviet Union to cheat without fear of discovery. Stone’s defense of the Warren Commission report , which rejected a conspiracy in the 1963 assassination of John F. Kennedy, angers many of his readers. In galvanizing public support for the Vietnam War, President Lyndon B. Johnson uses the orchestrated Gulf of Tonkin incident to justify the escalation, passing the Gulf of Tonkin Resolution through Congress just three days later. Stone is the first reporter to question the credibility of the government’s account, and he criticizes of the mainstream press for its omissions, lack of curiosity and susceptibility to official propaganda in reporting on the event. Stone suffers a mild heart attack. Former Department of Defense analyst Daniel Ellsberg confides in Stone that he was about to start leaking the secret history of the Vietnam War, known as the Pentagon Papers. In “The Killings at Kent State: How Murder Went Unpunished,” Stone writes about the shootings of four war protesters in 1970 by the Ohio National Guard. Suffering from severe angina and bad eyesight, Stone announces that he is shutting down his four-page, 19-year-old newsletter. I.F. Stone’s Weekly had a paid annual circulation of 70,000. Stone does his main writing in The New York Review of Books. Although Stone dropped out of the University of Pennsylvania, the university awards him an honorary degree, making him an official member of the class of 1928. I.F. “Izzy” Stone dies of a heart attack in Boston on June 18, 1989. "The Best of I.F. Stone" (edited by Karl Weber). New York: PublicAffairs, 2006. “The Court Disposes.” New York: Covici Friede Publishers, 1937. “Business as Usual: The First Year of Defense.” Modern Age Books, 1941. “Underground to Palestine.” New York: Boni & Gaer, 1946. “This Is Israel” (with Robert Capa). New York: Boni & Gaer, 1948. “The Hidden History of the Korean War: 1950-1951.” New York: Monthly Review Press, 1952. “The Truman Era: 1945-1952.” New York: Monthly Review Press, 1953. “The Haunted Fifties.” Great Britain: Merlin Press, 1963. “In a Time of Torment.” New York: Random House, 1967. “Polemics and Prophecies: 1967-1970.” Boston: Little, Brown and Co., 1970. “The Killings at Kent State: How Murder Went Unpunished.” New York: Vintage Books, 1971. “The I.F. Stone’s Weekly Reader” (edited by Neil Middleton). New York: Random House, 1973. “The War Years: 1938-1945.” Boston: Little, Brown and Co., 1988. “The Trial of Socrates.” Boston: Little, Brown and Co., 1988. Bruck Jr., Jerry, Writer and Director. Wicker, Tom, Narrator. "I.F. Stone's Weekly." (documentary film; 62 minutes, black and white.) 1973. Cottrell, Robert C. "Izzy: A Biography of I.F. Stone." Pisataway Township, NJ: Rutgers University Press, 1992. Flint, Peter B. “I.F. Stone, Icononclast of Journalism, Is Dead at 81.” The New York Times. June 19, 1989. Guttenplan, D.D. "American Radical: The Life and Times of I.F. Stone." New York: Farrar, Straus, Giroux, 2009. MacPherson, Myra. “All Governments Lie! The Life and Times of Rebel Journalist I.F. Stone.” New York: Scribner, 2006. Patner, Andrew. "I.F. Stone: A Portrait." New York: Pantheon, 1988.